Both titanium and tungsten are considered "model metals" in the jewelry industry due to the fact that at one time they were not available to the consumer market as commodities until a decade ago. 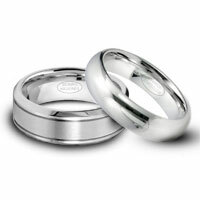 Tungsten and titanium have both grown very popular ever since, becoming a foundation of the jewelry material spectrum. As the new metals are unknown to much of the public there are many questions surrounding the suitability of the metals as jewelry. 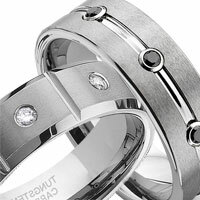 Below are bullet points regarding titanium or tungsten wedding rings and will hopefully allow you to make an informed purchase. 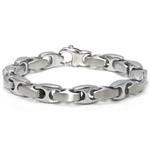 Titanium and tungsten are both superior in hardness over traditional metals such as gold, silver and platinum. Metals in their pure form are not the hardest they can be however it is their alloy that makes the metals extremely solid. In metallurgy the hardest form of tungsten carbide is harder than titanium alloys, and can only be damaged under extreme circumstances, such as abrasion from a diamond cutting blade. 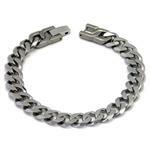 Titanium is more malleable than tungsten in the common alloys used in jewelry. So for example, when a titanium wedding ring is placed under high pressure, such as hit by a car door it will bend out of shape possibly cutting the finger or worse, where a tungsten ring would fracture into several pieces. 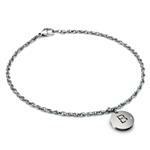 Many people are concerned they will be allergic to the jewelry. 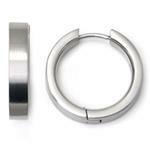 Titanium jewelry is safe to wear for almost everybody. 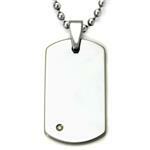 In some cases tungsten jewelry contains the element cobalt that can cause an allergic reaction in some people. An interesting fact is another form of tungsten alloy using nickel as a binder metal is hypoallergenic, even to people who are allergic to nickel. Titanium is lighter than tungsten, or to be more precise it has a lower density. Titanium alloys are about 43% lighter than stainless steel, and tungsten carbide is about 90% heavier than stainless steel. Due to chemical reaction titanium alloys produce different colors. 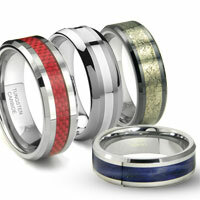 Jewelry manufacturers use anodization to coat colored patterns on titanium rings. 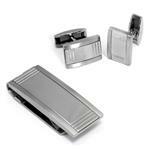 Black titanium is another form of titanium alloy that has a different color than the commonly used grey color. 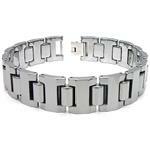 Tungsten carbide typically is only available in gunmetal color. Titanium jewelry is less expensive than tungsten jewelry due to the difference in equipment and environment control need to produce the metals. Tungsten and titanium are both cheaper than gold and for newly wed couples the beauty of the rings makes them just as valuable. 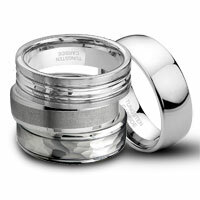 Both titanium and tungsten ring can be laser engraved but neither of them can be resized. 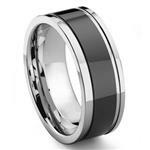 How tungsten carbide rings are made? Can you scratch a tungsten ring? 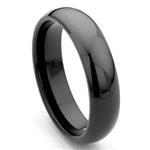 Do tungsten carbide rings turn your finger green?